In both 2012 (Sedge et al.) and 2016 (Sedge et al. ), the U.K. medical journal The Lancetreleased studies which presented abortion rate data from nearly every country in the world. Additionally, in March 2018 the Guttmacher Institute released a study entitled "Abortion Worldwide 2017: Uneven Progress and Unequal Access" (Singh et al.). The three studies are similar. They collect and analyze abortion data from a wide range of countries. They all find that global abortion rates have declined since the early 1990s. Additionally, all three studies present data which demonstrate that abortion rates are declining faster in developed regions of the world than in developing countries. In their study, Levine and Staiger used time series-cross sectional data to analyze how the legal status of abortion impacted abortion rates in a range of Eastern European countries. The authors hold constant economic growth, the inflation rate, and the age composition of women of childbearing age. Their findings provide overwhelming evidence that the incidence of abortion is affected by its legal status. They find that countries where abortion is legal only to save the mother's life or for specific medical reasons have abortion rates that are only about five percent of the level in countries in which abortion is legal on request. There was relatively little change in abortion policy at either the federal level or state level between the end of 1970 and 1973. However, the Supreme Court's Roe v. Wade decision in January 1973 effectively legalized abortion on demand in the United States throughout all nine months of pregnancy. Data from the Centers for Disease Control and Prevention (CDC) clearly show that abortion rates in the United States increased in both the short term and the long term. After the Supreme Court's Roe v. Wade decision in 1973, pro-lifers in the United States worked diligently to enact protective pro-life laws at the state level. 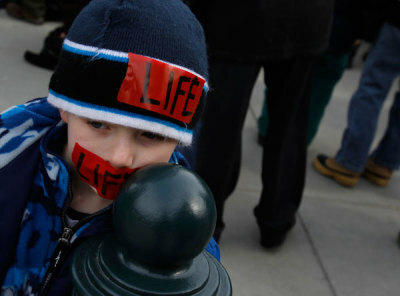 A range of state level pro-life laws has been enacted during the past 45 years. However, three types of incremental pro-life laws are the most common. First are public funding limits which prevent taxpayer dollars from paying for abortions through state Medicaid programs. Second are parental involvement laws which require that minor girls either notify or receive permission from their parents before obtaining an abortion. Third are informed consent laws which give women seeking abortions information about fetal development, potential health risks of abortion, and various sources of support for single mothers. The research on the impact of each of these three types of pro-life laws is summarized below. Overall, the authors of the Guttmacher literature review acknowledge that the best research indicates that Medicaid funding restrictions reduce the incidence of abortion. In the discussion which follows the literature review they state that "the best studies...used detailed data from individual states and compared the ratio of abortions to births both before and after the Medicaid restrictions took effect. These found that 18-37 percent of pregnancies that would have ended in Medicaid funded abortions were carried to term when funding was no longer available." They assert that the Cook and Parnell study which analyzed data from North Carolina had the "best design." They conclude by stating that "considering the case studies collectively, a reasonable estimate is that a lack of funding influences a quarter of Medicaid eligible women to continue unwanted pregnancies." The findings of these studies are very similar. After the passage of a parental involvement law, the research shows there is a statistically significant reduction in the in-state minor abortion rate ranging from 13 percent (Henshaw 1995) to 42 percent (Cartoof and Klerman 1986). Most studies found a decline in the in-state minors' abortion rate ranging from 15 to 20 percent (Colman, Joyce, and Kaestner 2008; Ellertson 1997; Haas-Wilson 1996; Joyce, Kaestner, and Colman 2006; Levine 2003; New 2011; Ohsfeldt and Gohman 1994; Tomal 1999). However, the two best studies on parental involvement laws which track and compare, both in-state and out-of-state minor abortions each show that the in-state abortion decline significantly exceeds the out-of-state increase. The first is "Parental Consent for Abortion: Impact of the Massachusetts Law." This study appeared in the American Journal of Public Health in 1986 and analyzed the Massachusetts parental involvement law which took effect in 1981 (Cartoof and Klerman 1986). The second is "Changes in Abortions and Births and the Texas Parental Involvement Law." This study appeared in The New England Journal of Medicine in 2006 and analyzed the Texas parental involvement law which took effect in 2000 (Joyce, Kaestner, and Colman 2006). Both studies were unique because they were able to analyze monthly data on in-state minor abortions, out-of-state minor abortions, and births to minors. Additional evidence pointing to the effectiveness of parental involvement laws comes from research indicating that the presence of a parental involvement law improves health outcomes for teen girls. A 2003 study in the Journal of Health Economics (Levine 2003) found that parental involvement laws reduce the pregnancy rate of 15- to 17-year-olds by four to nine percent. A 2008 study in the Journal of Law, Economics, and Organizationshows that parental involvement laws reduce the gonorrhea rate anywhere from 12 to 20 percent for females under 20 (Klick and Stratmann 2008). Finally, the journal Economic Inquiry published a study which shows that the enactment of parental involvement laws is associated with an 11 to 21 percent reduction in the number of 15- to 17-year-old females who commit suicide (Sabia and Rees 2012). There is somewhat less research on the effect of informed consent laws than there is on the effect of other types of incremental pro-life laws. However, the existing research does provide some evidence that properly designed informed consent laws reduce abortion rates. For instance, three studies specifically analyze the impact of Mississippi's informed consent law which took effect in 1993 (Althaus and Henshaw 1994; Joyce, Henshaw, and Skatrud 1997; Joyce and Kaestner 2000). This law was unique because it was the first that required women seeking an abortion to make two separate trips to the abortion clinic. Each of the three studies found that this informed consent law resulted in a statistically significant abortion rate reduction (Althaus and Henshaw 1994; Joyce, Henshaw, and Skatrud 1997; Joyce and Kaestner 2000). Two studies by New (2010, 2014) used time series-cross sectional data from nearly all 50 states for a span of 21 years to analyze the impact of a range of pro-life laws – including informed consent laws. His first study analyzed 33 state-level informed consent laws and found that they reduced state abortion rates anywhere from 0.74 to 1.10 abortions per thousand women of childbearing age. This would translate to a decline in the abortion rate of approximately 3.7 percent to 5.6 percent. New's 2014 study analyzed specific types of informed consent laws. He found that Planned Parenthood v. Casey-style informed consent laws, which require women to view color photos of fetal development prior to the abortion reduce abortion rates anywhere from two percent to seven percent. Additionally, informed consent laws that require two separate visits to the abortion facility reduce abortion rates anywhere from seven percent to 12 percent.